How cool is this? 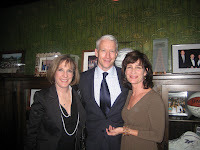 These are two of my sisters, Trish and Gail, hanging with Anderson Cooper. The report: Anderson was cool, interesting, authentic and FUNNY. That’s high praise from two of the coolest, most interesting, completely authentic and extremely funny people I know. Living the dream! Who’s on your list to meet? Jim Rohn suggests that you are the average of the last 5 people you hung out with. Hmmm. Love, peace, $$, freedom to you!